First-of-its-kind Study Shows ‘Practice Makes Perfect’ for Both Caregiver and Dementia sufferer. They do it with the best of intentions. “Do you remember our wedding day?” “Who is that person next to you in the picture?” For couples with decades of shared memories, a partner’s decline in the ability to communicate is one of the most frightening and frustrating consequences of Alzheimer’s disease and related dementias. For these couples, the communication strategies they have used before simply do not work anymore. Impaired communication leads to misunderstandings, conflict, isolation, and loss of intimacy. A first-of-its-kind study using a 10-week in-home intervention to support couples affected by dementia is showing that “practice does make perfect,” both for the caregiver and the care receiver or person with dementia. 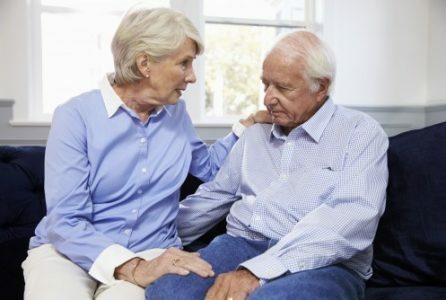 By involving both partners in the intervention using coaching and role-playing, researchers from Florida Atlantic University’s Christine E. Lynn College Nursing are the first to provide a more complete picture of communication behavior in couples affected by dementia with measurable outcomes. The study demonstrates how creative ways of working with these couples can change their communication behaviors in just 10 weeks. CARE (Caring About Relationships and Emotions) was designed to increase facilitative (helpful) communication in the caregiver and sociable communication in the care receiver. The relationship-focused intervention also was designed to reduce disabling behavior (impairing engagement such as criticizing or quizzing their partner’s memory) in caregivers and unsociable behavior (such as not making eye contact) in care receivers. A key finding from the study, which pleasantly surprised the researchers, showed that care receivers actually improved more than the caregivers following the intervention. Care receivers, who had moderate dementia, had statistically significant improvement in their social communication both verbally and non-verbally. They were more interested and engaged, maintained eye contact, responded to questions, stayed on topic, and even joked with and teased their partners. Caregivers’ communication also showed a statistically significant improvement in their facilitative communication (promoting engagement) and a statistically significant decrease in their disabling communication. “Caregivers are not experts in communicating with people with dementia. Sometimes they choose strategies they think are helpful, but may be ineffective. Also, they often give up communicating with their less verbal partners because benefits are not as obvious,” said Christine L. Williams, principal investigator of the study and a professor and director of the Ph.D. in Nursing Program in FAU’s College of Nursing, who designed the intervention program. “By teaching caregivers about their partners’ ongoing needs for closeness, comfort, inclusion, love and respect, they can make a difference in how they perceive their spouses and how facilitative communication, both verbal and non-verbal, can contribute to their well-being,” said Williams. For the study, couples received a manual at the start of the intervention with 10 weekly modules on a wide variety of communication issues. Researchers met weekly with the care receiver and caregiver separately; followed by a meeting with the couple together. At the end of the couples’ session, they were asked to converse unobserved by the researchers for about 10 minutes on a topic of their choosing. That session was videotaped. Researchers assessed caregivers’ learning needs, increased their communication self-awareness, knowledge about communication decline in dementia, common care receiver emotional reactions to lost abilities, and how to use communication strategies to maintain a caring relationship. Role-play between the interventionist and the caregiver was incorporated when additional practice was needed to demonstrate a specific strategy. Caregivers were coached to identify their communication style and that of their partners. Researchers also conversed each week with the care receivers to encourage their efforts to verbally express their thoughts, feelings, preferences and needs. Williams used a rating scale to measure the outcomes of the intervention and analyzed and scored 118, 10-minute videos of each of the couples’ sessions. Measuring both caregiver and care receiver communication weekly over several weeks provided a more complete picture of changes over time. Participants in the study all attended the Louis and Anne Green Memory and Wellness Center operated by FAU’s College of Nursing.